This tutorial is a basic introduction to MOA. 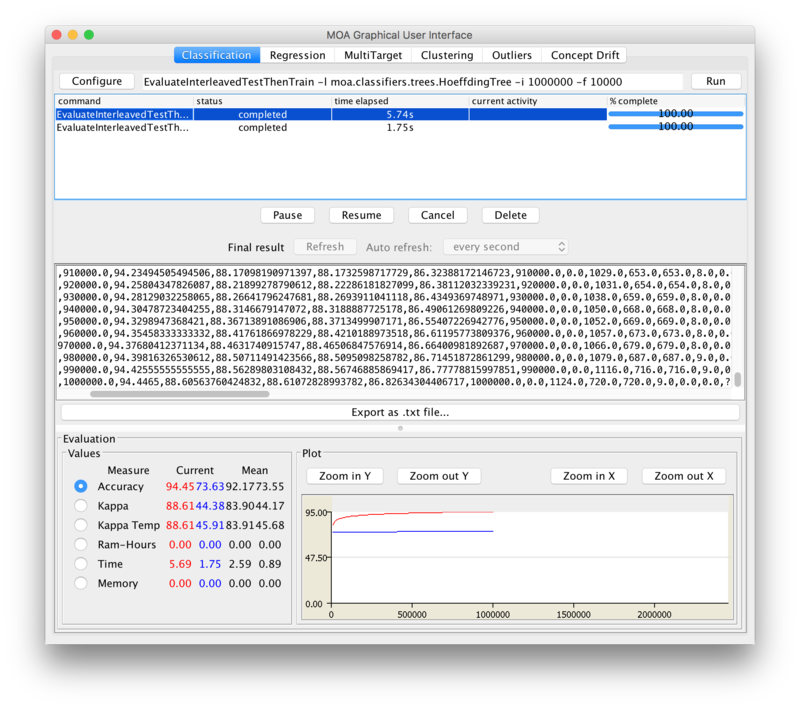 Massive Online Analysis (MOA) is a software environment for implementing algorithms and running experiments for online learning from evolving data streams. We suppose that MOA is installed in your system, if not, you can download MOA from here. We start comparing the accuracy of two classifiers. First, we explain briefly two different data stream evaluations. The algorithm is passed the next available example from the stream (requirement 1). The algorithm processes the example, updating its data structures. It does so without exceeding the memory bounds set on it (requirement 2), and as quickly as possible (requirement 3). The algorithm is ready to accept the next example. On request it is able to predict the class of unseen examples (requirement 4). that results from different studies can be directly compared. 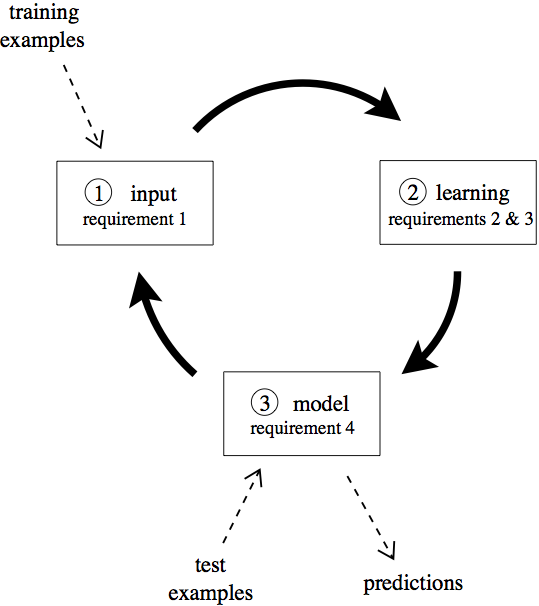 Interleaved Test-Then-Train or Prequential: Each individual example can be used to test the model before it is used for training, and from this the accuracy can be incrementally updated. When intentionally performed in this order, the model is always being tested on examples it has not seen. This scheme has the advantage that no holdout set is needed for testing, making maximum use of the available data. It also ensures a smooth plot of accuracy over time, as each individual example will become increasingly less significant to the overall average. Holdout evaluation gives a more accurate estimation of the accuracy of the classifier on more recent data. However, it requires recent test data that it is difficult to obtain for real datasets. Gama et al. propose to use a forgetting mechanism for estimating holdout accuracy using prequential accuracy: a sliding window of size w with the most recent observations, or fading factors that weigh observations using a decay factor alpha. The output of the two mechanisms is very similar (every window of size w0 may be approximated by some decay factor alpha0). As data stream classification is a relatively new field, such evaluation practices are not nearly as well researched and established as they are in the traditional batch setting. To familiarize yourself with the functions discussed so far, please do the following two exercises. The solutions to these and other exercises in this tutorial are given at the end. Exercise 1 Compare the accuracy of the Hoeffding Tree with the Naive Bayes classifier, for a RandomTreeGenerator stream of 1,000,000 instances using Interleaved Test-Then-Train evaluation. Use for all exercises a sample frequency of 10,000. Prequential with a sliding window of 1,000 instances. To model concept drift we only have to set up the drift parameter of the stream. Exercise 3 Compare the accuracy of the Hoeffding Tree with the Naive Bayes classifier, for a RandomRBFGeneratorDrift stream of 1,000,000 instances with speed change of 0,001 using Interleaved Test-Then-Train evaluation. Note that some parameters are missing, since they use default values. Exercise 5 Repeat the experiments of exercises 1 and 2 using the command line. For regression, let’s go back to the GUI. Select the Regression tab. Click ”Configure” and explore the options. You will see that there is a lot less choice than for classification. This is not necessarily a problem, because algorithms like the tree-based FIMTDD method work really well in practise. Run the default configuration for a first exploration of the regression tab. As we are abusing a classification dataset here, as generated by the RandomTreeGenerator, it should come as no surprise that the results are not that convincing. For a better experience, go back to the configuration, and select ArffFileStream as the stream source, and provide some large numeric arff file. You could use the ”census.arff” file and specify the first attribute as the target: -c 1. Now run FIMTDD again. If you want a faster regressor, also try the Perceptron. For better results, but slower execution, experiment with the various (random) rule learners. Prequential with a sliding window of 1,000 instances: 96:7%.